Due to heightened security measures the following baggage and parcel control policy is in effect for all Pearl Harbor attractions: Visitors are not allowed to bring bags of any size. This includes backpacks, diaper bags, fanny packs, camera bags, purses, luggage, shopping bags, large cameras or other items that can offer concealment. This policy is subject to change without notice. Baggage storage is provided for your convenience and the security of your personal items. It is located to the right as you enter the WWII Valor in the Pacific National Monument. There is a nominal fee of $5 per bag. Please do not leave valuables in your vehicle. Sandals are permissible (athletic shoes are recommended), but bathing suits or profane T-shirts or caps are discouraged. 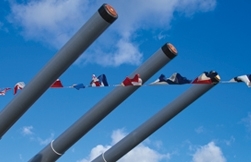 The Battleship Missouri Memorial will immediately captivate you from the very moment you arrive at her entrance gate. As such, please be aware of your surroundings as you cross the pier, board the ship and move about her decks. 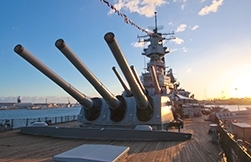 Begin hydration well before your arrival and continue to hydrate as you tour the Battleship Missouri Memorial. Concessions, vending machines and rest stops are provided on the pier and ship for your convenience. 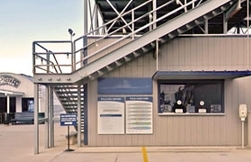 Restrooms are located on the pier - just as you enter our gates, and on the ship. 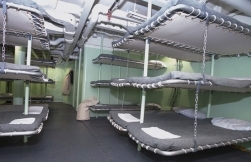 Pace yourself as you tour the pier and decks of the battleship. Always face the ladders and keep your hands free to ensure a firm grip as you ascend and descend her decks. Always stay in the designated route and please respect all safety signage.